At UD non-thermal post-harvest methodologies are studied with ready-to-eat food products. Research in the area of food processing focuses on high pressure processing and antimicrobial packaging to pasteurize foods, prolong shelf life, and inhibit pathogens. High pressure treatment research projects are focused upon the study of high hydrostatic pressure as a food preservation processing technology for inactivation of problematic spoilage microorganisms and pathogens, bacterial spores, and enzymes in foods and beverages. Current research projects include the use of antimicrobial packaging and high pressure processing to control Listeria monocytogenes on ready-to-eat meats and smoked salmon. 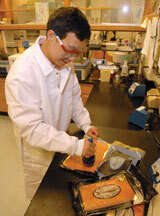 Other projects include the inactivation of enteric viruses in seafood and ready-to-eat foods. Other non-thermal technologies such as ozone and ultraviolet light may be used to make fresh produce safer while extending the shelf-life of fresh fruits and vegetables. Removing oysters from their shell is a time consuming and sometimes unsafe process, due to the sharp knives that processing employees must use to pry the shells open. Dr. Haiqiang Chen is working to improve the safety, both for opening and eating, of raw oysters using high pressure processing. High pressure processing opens the shells easily and can kill pathogenic bacteria and viruses often linked with human illness from raw oyster consumption. Dr. Dallas Hoover is a world leader in high-pressure processing techniques. Food manufacturers use this innovative technique to ensure that store-bought products such as salsa and guacamole aren’t just safe but almost as fresh-tasting as the homemade variety. Microbial Safety Food and waterborne microorganisms, including protozoa and viruses, can have significant human health impacts. Microbial safety research at UD uses microbial ecology and genetics to detect bacteria, viruses, and pathogens and develop intervention strategies. Other projects include assessing environmental factors in the transmission of bacterial and viral pathogens in agriculture and drinking water worldwide and investigations of factors controlling microbial contamination of fresh vegetables, such as leafy greens, when manures and wastewaters are used to fertilize and irrigate these crops. Current research projects under the direction of Dr. Kali Kniel include studying zoonotic pathogens including Cryptosporidium parvum, enteric viruses, and E. coli 0157:H7. Understanding the mechanisms of inactivation of these organisms is a means to gaining a better understanding of their control. The Food Science Program, in collaboration with the Department of Plant and Soil Sciences and the Department of Civil and Environmental Engineering, was recently recognized by NASA for a new technology developed at UD. The patented technology incorporates highly reactive iron in the filtering process to remove harmful organisms and viruses, including rotavirus and E. coli from water. Viral inactivation by elemental iron was chosen as one of the top seven technologies of 2007. 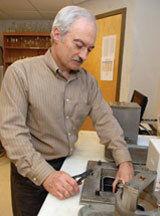 Food science faculty work with the Delmarva poultry industry to investigate potential industry problems. A project under the direction of Dr. Rolf Joerger assesses the basic biological properties of more than 2,000 Salmonella serotypes. Food toxicology research conducted at UD identifies toxins and biologically active compounds in foods. Dr. Changqing Wu studies the effects of processing methods on efficacy and safety of functional and minimally processed foods. 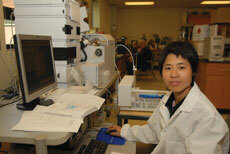 She also studies the modification of toxins for beneficial properties in disease prevention.